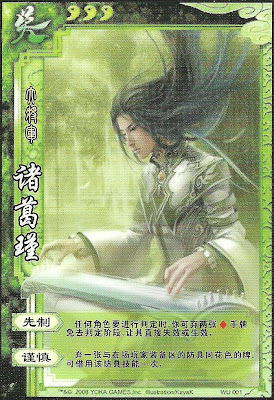 When anyone does a judgment, Zhuge Jin can discard two diamond hand cards to decide the outcome. Zhuge Jin can choose any piece of any player's equipment that he would like to use. He must discard a card of the same suit, and then may use that equipment's ability for one instance. Zhuge Jin does not need to specify what card the judgment ends on for "Preemptive". He simply determines if that person passed or failed their judgment. If there are more than two outcomes, Zhuge Jin can choose any of them. Zhuge Jin ends all judgment tinkering. When it gets to him and he uses "Preemptive", the judgment is decided and it then goes into effect. Beforehand there may be tinkering, but Zhuge Jin will override all that if he chooses. "Cautious" can be used both during and outside of Zhuge Jin's turn. He must discard a card for every instance that he would like to borrow equipment. He cannot borrow a player's +1 horse outside of his turn. If someone can reach him, there is nothing he can do to avoid that. If he is attacked, however, he can use anyone's armor.